Above all, Barnes explains how the Dead were masters of what he calls "strategic improvisation" -- the ability to adapt to changing times and circumstances -- and that their success lay precisely in their commitment to constant change and relentless variation. For an extraordinary thirty years, the Dead improvised a business plan and realized their vision -- all while making huge profits. 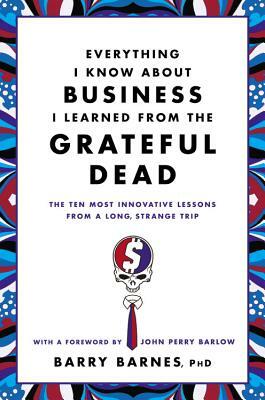 EVERYTHING I KNOW ABOUT BUSINESS I LEARNED FROM THE GRATEFUL DEAD will show you how they did it -- and what your business can learn from their long, strange trip. "Barry Barnes deftly shows how the magic and authenticity of the Grateful Dead transcends its musical prowess, providing invaluable insights into how successful organizations thrive." "In their early days, the Dead's extreme fondness for idiosyncrasy earned them a reputation as business naifs. But irony of ironies, by persevering with policies rejected by their "smarter" brethren, they ended up as a stunning business success story. The best part was that they succeeded because of, not despite, those decisions. Barry Barnes' Everything I Know About Business I Learned from the Grateful Dead tells you how they did it."